I am currently a Master's student at the University of British Columbia under the supervision of Dr. Craig Hart, with my project focus being the characterization of the Kasalka Group volcanics in north-central British Columbia. This is a collaborative project with the Mineral Deposit Research Unit and Geoscience BC's TREK project. I graduated from Queen's University in Kingston, Ontario in 2014 with a B. Sc in Geological Engineering. 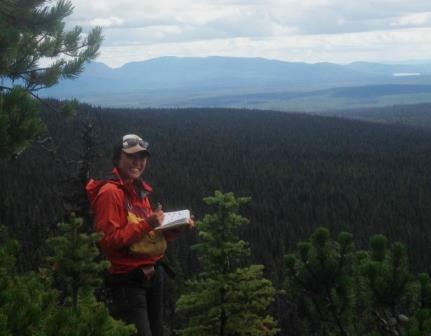 During my undergraduate degree, I was fortunate enough to hold two summer student assistant positions with the Yukon Geological Survey, which allowed me to build my regional mapping skills and field work experience in various parts of the Yukon. I was also able to apply my interests in geological sciences and natural resources on my work -- my final undergraduate engineering design project was focused on outlining an advanced exploration program, resource estimation and preliminary mine design for a carbonatite-hosted niobium deposit in northern Ontario. I also completed an honours thesis with the Yukon Geological Survey, researching Eocene intrusive suites of the Dezadeash Range in southwest Yukon. Reaching completion of my first year of graduate studies, I have presented a poster at the 2014 Roundup and Cordilleran Tectonics Workshop conferences on my research to date. I am spending the summer of 2015 working as part of the bedrock geology team's second field season for the TREK project in north-central BC. My project focus is on the Late Cretaceous Kasalka Group volcanics in north-central British Columbia, working with the TREK (Targeting Resources for Exploration and Knowledge) project. Originally defined in the Kasalka Ranges along the eastern margin of the Coast Belt, the Kasalka Group further east in the northern Interior Plateau is poorly understood due to limited exposure of complex bedrock geology. Using geochronology, geochemistry and regional mapping, this study will provide detailed characterization and stratigraphic constraint on Late Cretaceous volcanism and its ties to current and prospective mineral exploration in the region, most notably New Gold’s Blackwater project.